Mount Dora, Florida is considered an artsy community. Popular locations downtown are the Modernism Museum and Mount Dora Center for the Arts. Local artists operate an arts collective, with murals adorning the building and walkway in. Its 43rd annual arts festival is taking place this weekend. 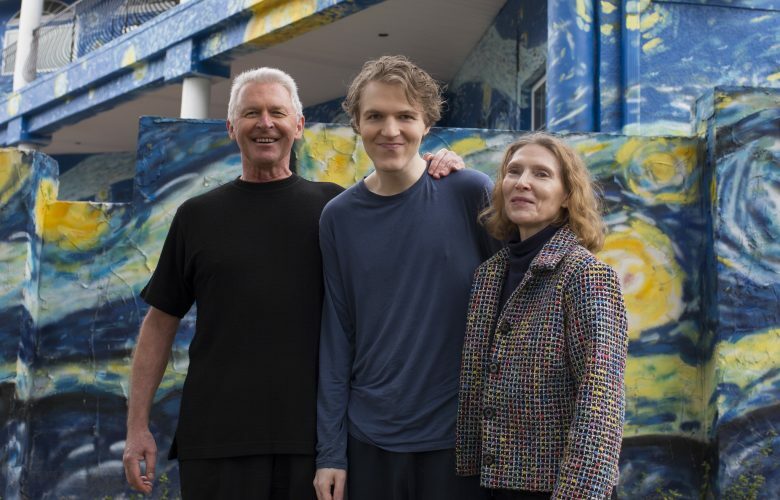 But city officials have targeted one piece of art in the community–a mural inspired by Van Gogh’s Starry Night–and they are intent on having it removed, even if there’s no statute giving them that authority. The City contends that the mural violates its “sign ordinance,” which regulates the placement of signs on one’s property. This morning, the City imposed a hefty fine of $8,600 on Nancy Nemhauser and Lubek Jastrzebski, and the fine is set to grow by $100 every single day. The city hopes that the ever-growing fine will convince the family to abandon their lawsuit challenging the City’s interpretation of the sign ordinance and paint over the mural that adorns their home and a surrounding wall. 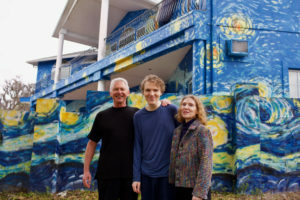 It started when a local artist approached Nancy and Lubek last July and asked them if they had thought about repainting the wall that surrounds their house. The wall’s paint was cracked and peeling, and the couple immediately fell in love with the idea of painting an artistic mural. They settled on a design reminiscent of Starry Night by Vincent Van Gogh. Nancy called the Planning & Zoning Department and asked whether or not they could do a painting on their wall. The city responded (truthfully) that the city code has no aesthetic restrictions on painting and there was no permit required. They contracted with the artist, and the artist began work. But in August of 2017, they received a notice of violation on their door. Code Enforcement had decided that the mural was “graffiti,” and ordered the family to paint over it. When Nancy called the city and asked why the mural had to be removed, the code enforcement officer said that the wall needed to match the house. Nancy and Lubek swiftly contracted with the painter to extend the mural to the full house. Nevertheless, the city pressed forward with their enforcement action, but at the hearing, they shifted their position. Acknowledging that the graffiti code did not apply , it instead alleged that the mural constituted a “sign” simply because it attracted the attention of people. It’s hard to imagine what wouldn’t be a sign under a definition this broad. A nice car parked in a driveway, a hanging flag, or distinctive landscaping could each be said to attract attention. Nancy and Lubek have appealed this absurd interpretation, and Pacific Legal Foundation has agreed to represent them, free of charge. Mount Dora’s application of the sign code raises significant constitutional issues of free speech, due process, and equal protection. Our opening brief arguing that the sign code is unconstitutional will be filed next week.